Brownie Caramel Cheesecake is such a decadent dessert. Share a picture on Instagram and Facebook when you make it, and you’ll have friends and family members rushing over for a visit. Trust me, this will happen. I speak from experience. I love it when a dessert comes together easily, yet looks like you spent hours preparing it. Such is the case with this Brownie Caramel Cheesecake recipe. It’s a lot simpler to make than you might think. Recipe makes 1 – 9 inch springform pan. Preheat oven to 350 degrees and grease the bottom of a 9 inch springform pan. Tip: Wrap the bottom of the pan in foil to prevent leakage. In a small bowl, combine the brownie mix, 1 egg and water. Using a fork or a whisk, mix thoroughly then spread into the greased pan. Bake for 25 minutes. Meanwhile, in a heavy saucepan, melt the caramels with the evaporated milk over low heat. Stir often, and heat until a smooth consistency is achieved. Reserve 1/3 cup of the caramel mixture, and pour the remainder over the warm, baked brownie crust. Bake for 40 minutes. Chill in pan at least 4 hours, preferably overnight. When cake is well chilled, loosen by running a knife around the edge, and then remove the rim of the pan. Heat the reserved caramel mixture, and spoon over cheesecake. Drizzle with warmed chocolate fudge topping. 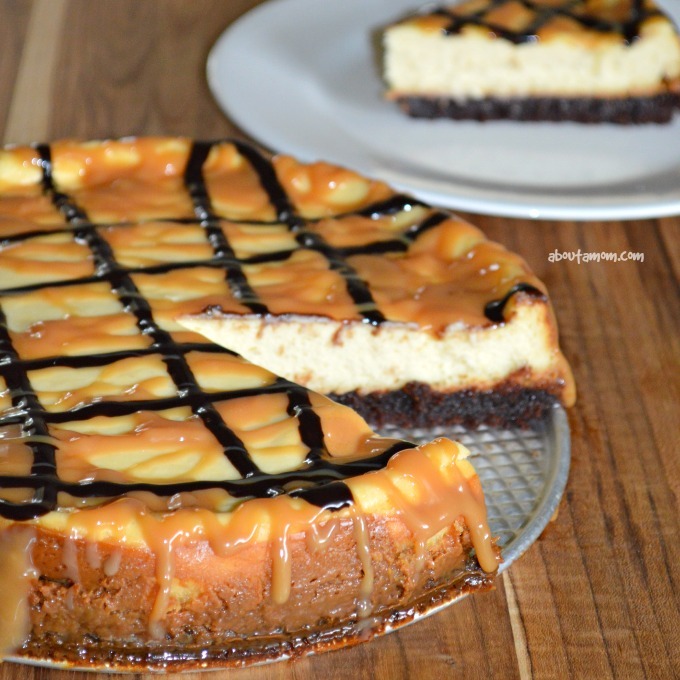 A wonderfully decadent Brownie Caramel Cheesecake recipe. You might also like these Mixed Berry Shortcakes! Oh, that is outstanding! This is one of the best cheesecake recipes I’ve seen in a while. Yum! Wow. This looks absolutely Incredible. Oh boy, It would kill me not to eat way too much of this! Oh my gosh these look so good! Brownies, caramel and cheesecake? Three of my favorite things! Yum! OMG! This looks absolutely amazing. I want it like now. I am going to ask my hubs to make it for Mother’s Day for me. I don’t think I could wait to take pictures if I did a post like this. 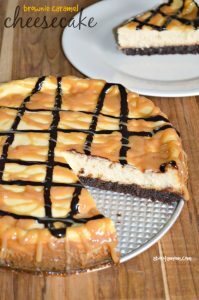 That cheesecake looks so yummy, anything brownie and caramel is my sweet spot! Oh my gosh! Now that looks like it could quickly become my #1 favorite dessert! Yummy! That cheesecake is all of my favorite things in one! Caramel, chocolate, and cheesecake…oh my! we are having a Mother’s Day brunch and this would be a lovely dessert to serve. Or I could hide it and eat it all myself! I can see my family loving this recipe. I’ll have to try this! Can you send a slice or 5 my way? This would be the perfect cake for me! I’ve never made one at home. It’s the one item that I think is always good store bought. I bet it would be even better homemade though. Brownie and cheesecake. The best of both worlds. How yummmmmy. I need this right now. This looks so delicious. I will have to try making it this weekend. I am sure we will love it. I love cheesecake. This looks wonderful. Oh this just looks amazing! Pinning this for later! That looks so delicious right now! I wish I could have some for dessert! Oh my lanta, this looks so decadent and delicious!! 🙂 Pinned! That looks way too good. Like bakery shop window good. So yummy! All my favorite flavors….yum! Pinned! This looks so yummy! I have been working on mastering cheesecakes the past year. I will have to try this, Many blessings to you! Wow, this looks too good to eat, not really. So yummy looking. Putting this on my must make list. Love this! Thanks for sharing at the #HomeMattersParty – We hope to see you again next week! Brownie, caramel, and cheesecake in one! This is going to have to be my choice of birthday cake. This would be so awesome with a side of vanilla bean ice cream! YUM! Oh Man, I want some of this. This is such a pretty Cheesecake and I like the Brownie crust and want to make this dessert for a cold Summer dessert. Thanks for sharing! You put two of my favorites together, brownies and cheesecake! There are very few things I like better than cheesecake, but chocolate & caramel might be two. So, putting all three together is genius! This looks like an amazing cheesecake! You’re killing me here! This looks so amazing! I just bookmarked it- I needed something for my father in laws birthday this weekend- and this will be perfect. That is if I don’t devour it first! I love that this has brownie and cheesecake together! It looks super delicious! This lols so yummy I would love to try this one day. Oh my! This looks heavenly! Certainly something I need to try out. Yes, it looks scrumptious, BUT WHERE DO GET A 9 OZ BOX OF BROWNIE MIX-NO WHERE TO BE FOUND! NOT AT MARIANO’S; JEWEL, TRADER JOE’S; ETC.? This cheesecake recipe looks so delicious. I love how creamy each bite looks. loving this recipe! pinning for later! thanks! You are both brilliant! This is so pretty and looks delicious. Can’t wait to try it!! Thanks for the recipe. Have a lovely day! This looks like an amazing cheesecake. This looks amazing! Totally have to try it! Thanks so much for linking up with our Living With Style Linky Party and hope you’ll do so again the next time. Have an awesome week! Just pinned since I ran out of printer ink. I am going to try this except maybe get that caramel already made for dipping apples and use it. Oh my gosh. I need to make this right now! Oh, this looks absolutely amazing. My mom is visiting at the last of the month, I always try to make a few special items when she is here. She would love this. This dessert looks absolutely mouth watering! I am so surprised that it didn’t take you all day to make. I must give this a try! I am a huge caramel fan and this looks so good! This is one of the most delicious cheesecakes I have ever seen. I will be trying this out on my family over the upcoming holiday. Thanks for the great recipe. This looks so yummy! I would love to try this! This looks absolutely incredible!! I am not sure if I would be able to make it that pretty, but I really want to try this now! Thanks for the recipe! This looks so good! Cheesecake is just wonderful! This cheesecake should come with a “danger zone” sign! It look soo good, and I”m thinking it is easy b/c you don’t need to worry too much if there is a little bit of a crack on the top of the cheesecake – nobody would know – or care!